The sexes are nearly identical. Most of the visual clues have been "educated guesses" at best for me. The most reliable method of sexing has been to wait for the males to sing their courtship song. Some of the visual clues include: the thickness of the breast bar, the width of the crown and the whiteness of the face mask. In males the breast bar is said to be thicker, the crown of the head wider and the face and upper breast whiter than the females. All of these methods are more reliable if you have a number of birds to look at and compare. Just trying it with one pair is difficult unless you've seen a lot of Owl finches. There is one subspecies listed for the Owl, T. b. annulosa, or the Black-rumped Owl finch. The only difference that survives of this subspecies in aviculture is the black rump coloration which is autosomal recessive to the nominate form. In the wild there are some other differences in size and tail length, but these have been lost in the crosses with the nominate white-rumped variety. Birds that are the result of a white-rump crossed with a black-rump will show some mottling of the rump color. These birds hold the recessive gene for the black-rump coloration. These birds can then be crossed with other birds showing this mottling or to Black-rumped Owls to produce more of the black-rump color. A standard finch mix will be fine with Owl finches. 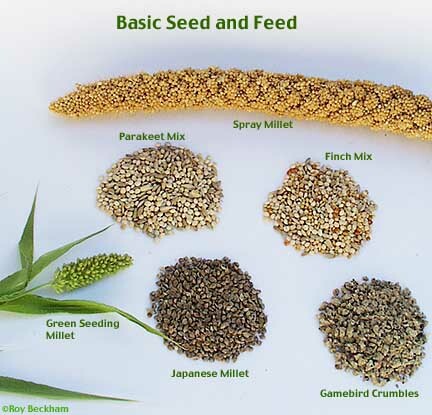 They eagerly take egg food (Roy's egg food), greens and soaked or sprouted seed. 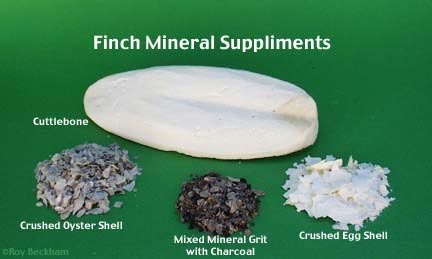 Grit and calcium in the form of crushed egg and oyster shells and cuttlebone should always be available to them. Owl finches can be bred in cages or aviaries, in pairs or in colonies of 3 or more pairs. I have bred them in my standard breeding cage and in longer flight cages. 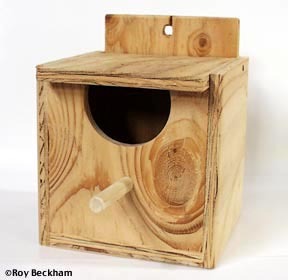 They will take a variety of nest boxes, milk carton nests and baskets with a real preference for the baskets, however I don't like to use these.. They will use dried grasses, coconut fibers, feathers and strips of paper in their nest construction, often lining them with soft feathers, paper or fibers such as jute. Soon after, 4-6 small white eggs are laid with incubation starting after the 3rd egg is laid. 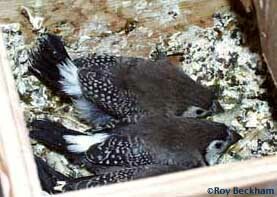 Incubation is carried out by both the male and female and lasts about 13 days depending upon high tightly the pair sits. The chicks hatch out with dark skin and gray fuzz, looking nearly identical to Zebra finch chicks. Owl finches fledge in abou 18 days days and look similar to the adults with the exception of the dark beak and the white areas are much grayer. The fledglings are independent in about 2 weeks. The biggest difficulty with Owl finches is getting them to settle down long enough to nest (problem is second only to accurately sexing the Owls). 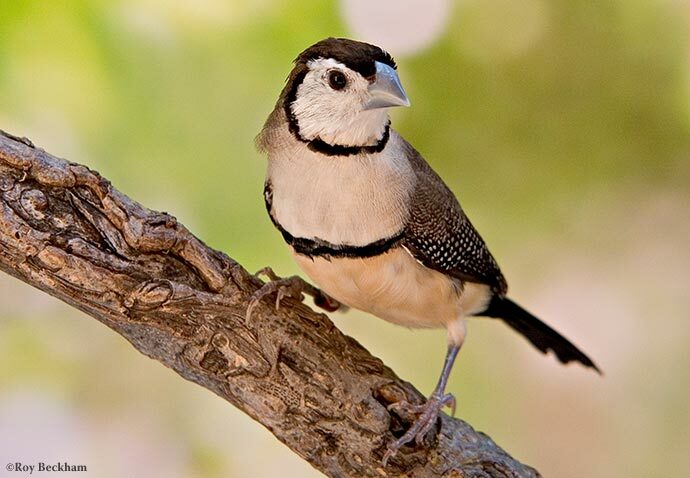 The little guys act more like waxbills than their nearest cousin the Zebra finch. I learned from another breeder to offer plenty of cover when trying to breed them in cages. 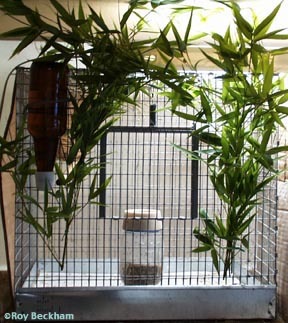 I'll tie bamboo branches or plastic plants to the outside of the cage to offer them some cover (bamboo covered cage). Even though they have a definite preference for the woven baskets, I try to get them to use nest boxes instead. 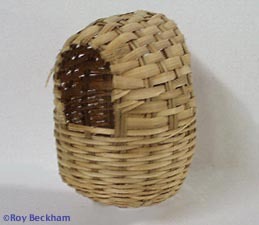 The baskets are difficult to check on and their nails can get caught in the weaving. My parents now have an Owl finch without a foot because of these baskets. The nest boxes constructed of milk cartons seems to be ideal for the Owls as well. 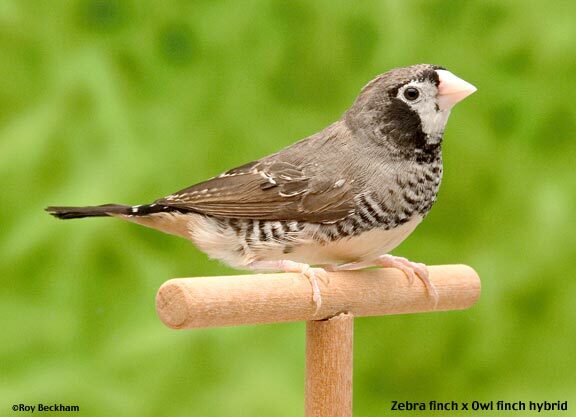 Owl finches can be fostered under Zebra or Society finches. When trying to foster eggs with a pair of Zebra finches, I recommend not mixing the clutch with zebra eggs. Even though the chicks are nearly identical in appearance, I could still identify them by the greater amount of fuzz and the mouth markings. Apparently, so could the Zebra finches who tossed them out. It could have been the amount of fuzz, the mouth markings, the begging noises or their more rapid head and neck movements of the begging chicks. I feel that the Zebras would have taken care of them had they not been mixed in with their own chicks. I have not had any problems fostering them under Society finches, even when mixed with Zebras, Rufous-backed mannikins and Society finches. 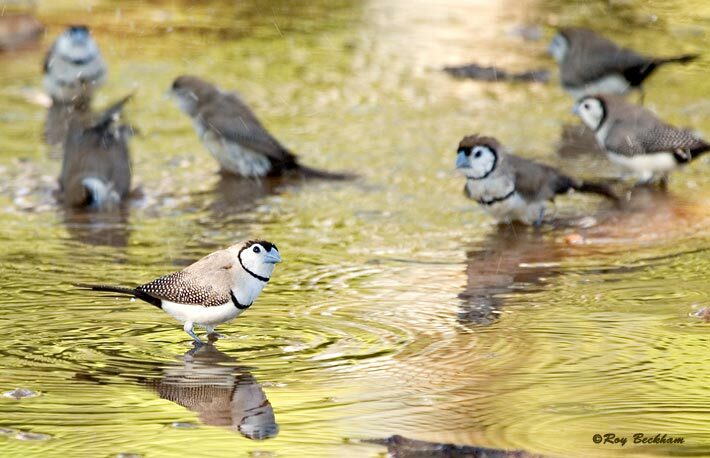 Owl and Zebra finches are the only two species in the family Taeniopygia. They were previously grouped with other grassfinches in the family Poephila. Owl finch chicks will display some odd behavior for an Australian species. They will raise an opposing wing while begging. This is very similar to a pattern shown by African mannikins such as the Rufous-backed mannikin. It is believed that this is to shield other siblings from the feeding parent. It does not seem to retain this behavior into adulthood as a defense posture like the Rufous however.